As an avid reader, I come across many different character types and personalities. While I am happy to see that, I do occasionally find discrepancies with the way that introverted characters are perceived versus how they actually are. 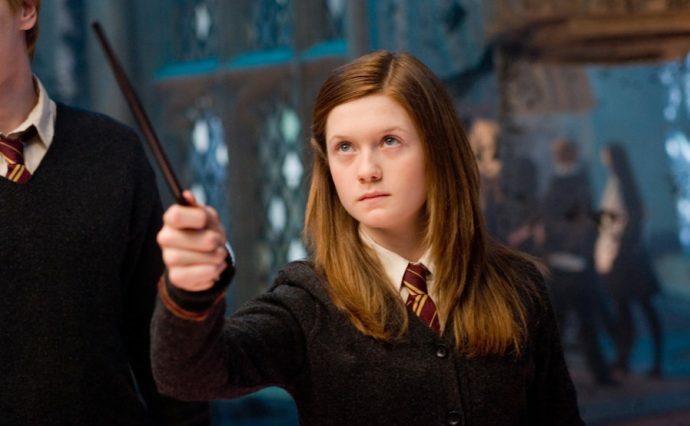 If you look at Ginny Weasley from the Harry Potter series, for example, she could easily be described as an introvert. She is never actually labeled as one, but she displays many characteristics associated with introversion. However, upon some quick Google searching, you may see that Ginny is actually labeled as an extrovert in some articles, like this one. Ginny is quiet and usually lets others be the center of attention. She is very shy and manages to say only a few words to Harry every now and then. While shyness in and of itself does not indicate introversion, Ginny’s avoidance of crowds and her being content to remain in the background does. Ginny, though, sometimes displays outgoing qualities. After arriving at Hogwarts, her relationships (both friendships and romantic ones), begin to blossom. As they do, her trust and comfort in the people around her grow as well, which allows her personality to shine. As the series progresses, the reader sees her growing more confident and skilled. She even becomes an important and revered member of the quidditch team. I believe, however, that despite all this, she is an introvert at heart. I say this because I, the biggest introvert I know, can be mistaken for an extrovert in the right situation. If I am with close friends or my husband, I can grow uncharacteristically outgoing just from being completely comfortable with my surroundings. This is why I identify very much with Ginny. Just as it can be too easy to classify a shy person as an introvert, it can also be too easy to classify an outgoing and even talkative person as an extrovert. Outward qualities can be deceiving, depending on the situation. I would argue that Ginny is the most underappreciated character in the entire series. It can be said that extroverts tend to receive more praise, since they typically command more attention, and introverts are more likely to be glossed over or forgotten about. Ginny is a classic victim of this, which is another aspect that reveals her introversion. Her arrival in the series is mentioned only briefly before moving on to other things, and it becomes easy — expected even — to forget she is there. Towards the end of the second novel, it is revealed that Ginny had been helping Voldemort (under magical duress) carry out the attacks on students throughout the school. It comes as a shock to the reader because Ginny is, quite literally, the last person that anyone ever thinks of. In the fandom, as well, Ginny’s role seems to be occasionally praised and quickly forgotten. She has moments that command attention, such as certain times when she gets to show off her knack of mastering magic or playing quidditch, but for the most part, she is overlooked. Only her association with other main characters, such as being Ron Weasley’s sister and Harry Potter’s eventual girlfriend, seem to keep her closer to the spotlight. It isn’t that I never see introverted heroes, because I do. The problem is that when there is an introverted protagonist, there seems to be a need to make them extra odd or unusual as a bid to make them interesting and less forgettable to readers. If you look at Luna Lovegood, for example, she shares many qualities with Ginny. She is relatively quiet, tends to avoid crowds, and spends most of her time in contented solitude. She, like Ginny, takes part in many of the heroic events and survives the final battle, eventually marries, and lives a full life. Unlike Ginny, however, Luna is much more beloved by the Harry Potter fandom and is frequently named as one of the best characters in the series. Why is that? With such seemingly similar personality types, but quite different responses from most fans, what sets Luna apart from Ginny? Well, in addition to those qualities listed above, Luna also wears her shoes to bed, makes up nonsensical creatures that she claims to be looking for, and reads magazines upside down for no apparent reason. While all this garners her a lot of teasing and earns her the nickname “Loony” from her classmates, her quirky charm eventually wins over Harry and the other protagonists and, by extension, the readers as well. Suddenly, Luna is considered interesting and worthy of being paid attention to, even if it’s just to be entertained by whatever odd thing she says. And Luna is interesting and worthy of being paid attention to, but so is Ginny and everybody else. I think most introverts would agree that they sometimes feel forgotten or left out. And although introverts enjoy spending time alone, being purposely left out feels hurtful. We may not like to be put on a pedestal in front of a jeering crowd, but we do like to be acknowledged and treated equally. For this reason, I believe that Ginny endures the hardships that many introverts face in real life. While confident and gifted in her abilities, she often gets overlooked in favor of more talkative characters. Her accomplishments are received with rather lukewarm responses from characters and fans alike. She is quiet and strong, but not overly bizarre like Luna is, which deems her uninteresting or unworthy of attention most of the time. There is an old saying that actions speak louder than words, but apparently, that’s not true in some cases. If it were, then Ginny and other introverts alike would be judged by their actions and endeavors instead of their lack of vocal interaction. While there are, of course, plenty of exceptions, there seems to be a general belief that introverts are to be ignored and discarded if they don’t, like Luna, prove themselves interesting enough to be well-received. Personally, I believe that Ginny is a hero. She remained a quiet strength in a world wrecked with cruelty, fear, and misjudgment, much like our own world. I only hope that I can follow her example as I navigate my way through whatever life throws at me.